First you need to make the roses. For the how to click here. The size of your wreath will determine how many roses you will need. It is always better to estimate higher than you think. My wreath is a 14 inch compressed foam wreath. I used 116 roses but would have liked a few more. I estimated that I would need 130 roses but got tired and impatient. If you're like me, consider making a smaller wreath. The wreath form was a bright green colour. I didn't want this to show through so I gave it a quick coat of paint. I used some trim paint that was left over from painting Rebekah's room. To see her room click here. I painted both sides as I know I will be hanging it on a mirror. Using a glue gun, start glueing the roses on the inside of the wreath. Try to keep them evenly spaced. Next to the same for the outside. Now start to fill in around the front. Here you will want to place them closer together so that the form doesn't show through. Continue filling in the wreath until you go all the way around. Then step back and look for holes and glue strings. You may have to add roses if you have missed a spot. If you are having problems getting rid of all the glue strings, get your hair dryer out and melt them away. I like to hang my wreaths on a ribbon so no hook is required. If you need a hook you can add a piece of wire to the back and secure with hot glue. what a fabulous idea! thank you for sharing! it looks wonderful! Muuust try! Bonjour comment faire 1 rose ? 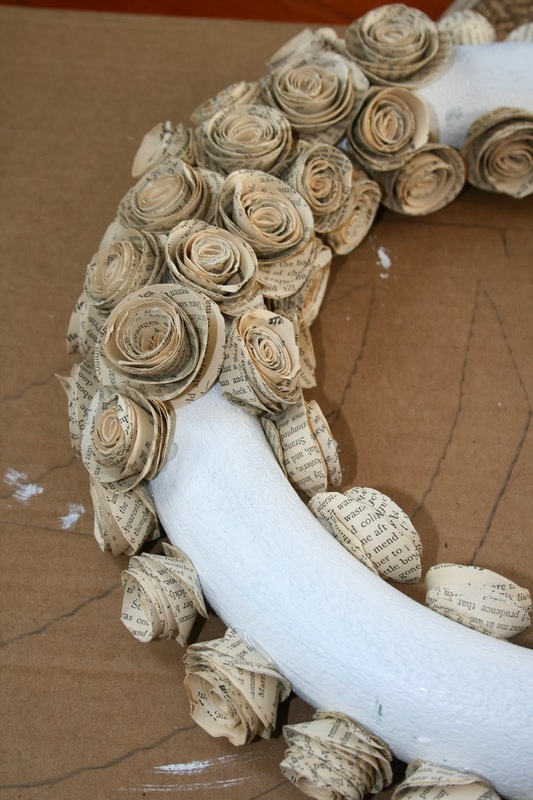 I decopouged my foam wreath with book pages then added my flowers. I also hung on a mirror, but I didn't have to add flowers to back side of wreath. This is a great idea! Thank you for sharing it. Betty. I will probably be making a smaller one, as you suggested! Although, who knows how many flowers I will create once I find my groove. Excited to start. Thank you for the inspiration! Like the pink hue in the roses. Did you paint/water color pages first?